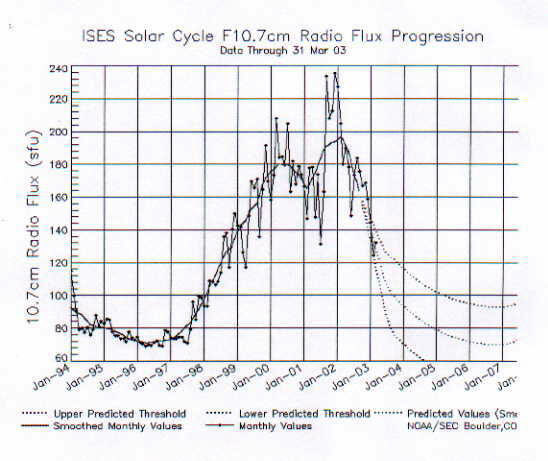 Solar Cycle - the picture ... Designing for cyclical disasters and other predictable events ... Weather? The human factors approach is an outgrowth of my flying and airport design work. Physiology and psychology are inherent to aviation. Someone suggested I focus on just two or three areas, which I initially did. But then people would ask about, for example, fear of flying, and we would work on that and it would be wildly successful. And then someone else would ask about weight loss and that would also work out extremely well. Hypnosis principles [working in a trance state with carefully formulated suggestions] allow work 10 or 20 times faster than in a non-trance state and carry over from one application to another. They also allow for processes that might not even take place at all otherwise. Design-wise, there has been a LOT of work that kind of melds and merges the hypnosis with design ... combining human factors (physiology & the way the brain works) with new technology. More of my usual tricks crossfeeding technology from one industry to another or from one engineering discipline to another, usually driven by all else failing or by impossibly short deadlines. Working with ad hoc teams of call-in consultants, call-in contractors and operating folks. Attended a mind-blowing seminar on technology which is state-of-the-art for some clients but cutting edge for other clients. I think most of us are 50 years behind. During the last year, did a LOT of systems integration for traffic signals (aka: "tweaking to make it work"), wireless communications, wireless video, battery power; video for counts, classification, presence detection, actuation; signal timing with railroad preemption; PLC's for emergency evacuations. Getting away from copper wire communications and induction loop detection - although ... sometimes ... a $20 POTS phone line is just the right thing. Anti-terrorism items for FEMA and Homeland Security with very fast completions required. Solar Cycle: Part I - Al Masetti's theory of "the bends"
Did you ever wonder why sometimes "everybody" seems to act irritably and drive irrationally? If one were to check the weather report, I'd bet that there is a low-pressure front approaching. Did you ever wonder why people with arthritis claim they can feel it in their joints when it's going to rain? Then, check the weather report; there is definitely a low pressure front approaching. It is my theory that the reason for the irritability, discomfort and pain is that when a low-pressure weather front is approaching, the air pressure outside our bodies is dropping faster than inside. The differential air pressure causes a case of "the mini-bends." Test this yourself the next time you feel awful (assuming it's not a hangover): check the weather channel for the presence of an oncoming low pressure front. Maybe long-term cyclical changes to atmospheric pressure and temperature are caused by the Solar Cycle. Maybe we could call these the "micro-bends". See Part Four. Conversely, when there is a high pressure front approaching, then we all feel really good!! - almost euphoric. Optimistic! Solar Cycle: Part Deux - "The Picture"
The solar cycle reaches maximum amplitude about every 11 years. This has been recorded since the 18th century. Although only 23 cycles have been numbered, the graphic record of all 30 is printed herewith along with the rare double peak of #23. The double peak may account for last summer's drought and the bizarre winter and spring weather we've had this past year. The periodic appearance of spots on the solar surface defines a cycle. As you can see, there is much more than a minor 5% fluctuation (worrying to some) during solar cycles. Once upon a time, sun spots conjured up images of UFO sightings and other fringe behavior, but the fact is that the little black dots do exist. We can count them and plot their numbers on a graph. Check out spaceweather @ www.spacedaily.com. The first sign of a new cycle is the appearance of spots near solar latitude 40 degrees. As the cycle rises, the number and size of spots increase (varying from 5 to 200, peaking @250 on an unsmoothed curve), as do the number of flares. The various emissions increase in intensity. The solar atmosphere becomes increasingly violent and turbulent, which results in clouds of material being ejected into space. This stream of ejecta is called the solar wind and when these "substances" reach us, they cause the Earth's atmosphere to stretch away from the sun. Because the solar wind is ionized plasma, it interacts with the Earth's magnetic field. The interaction of the solar wind and the Earth's magnetic field also create cusps or openings in the Earth's magnetic fields, resulting in enormous concentrations of solar energy at the north and south poles in "magnetic funnels". 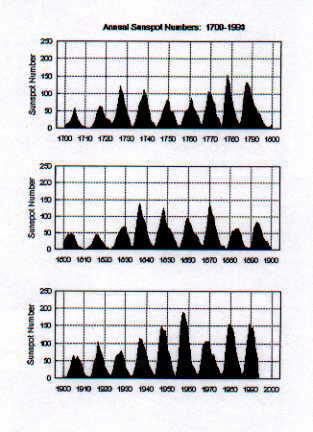 Some effects of sun spot solar cycles include power grid failures in northern latitudes [on March 13, 1989 at 2:45 am, the entire Quebec power grid collapsed], failure of Loran navigational systems because of lack of propagation, retinal flashes in astronauts, satellite failures and, because of the correlation with the last few droughts here in New Jersey, perhaps play a part in changes to the path of the jet stream. Much of this information is available in "Sigint and Sunspot Maximum," a public domain report by N.C. Gerson, July 2, 1998. If you would like a black & white copy, the first 20 people who e-mail me get it free. Everybody after that has to pay postage & handling. For amateur heliographers, there is a ton a tantalizing source material on the net. Check out Robinson, Soon, Baliunas, Singer and others. If then, weather extremes are periodic and if these extremes correlate to the solar cycle, then we ought to be able to use that periodic cyclicality for planning and design purposes. For example, if we can reasonably (although not EXACTLY) predict the solar cycles and the attendant droughts (for example, here in the northeast), then why not design by using these factors. The drought last summer in New Jersey and surrounding areas was quite severe. I have commented about droughts being normal climatolgical events. These comments seem to get people agitated because the media and some friends believe SUVs cause climactic changes, but never fluctuations in solar emissions?? NEVER! I would make a motion that we use the predictable periodic low water levels in reservoirs as low-cost natural windows of opportunity to cheaply excavate them and increase their capacity against future abundant rainfalls. People look at me funny when I suggest this. Maybe I have been around too long to get panicked by the people who delight in stirring up the crowd, but we had almost identical droughts around 1970, 1980, 1990 and now around 2000. We know, although it is never acknowledged, that these droughts are not only recurrent events, but also they are almost predictable-about every 10 years. We also know that the fluctuations in solar energy causes the Earth's atmosphere to warm and cool and thus to expand and contract in increasing and decreasing ambient air pressure. We know that the high altitude jet stream fluctuations are associated with the droughts in the Northeast and correlate with and may be caused by the fluctuations in the solar cycle. None of this is magickal or mysterious. What we need to do is take advantage of the predictable cycles in the weather by using the lulls in rainfall (droughts) to inexpensively improve water storage capacity for when we have surplus rainfall against that predictable dry year. We all know about putting money away for a rainy day; well this is almost the same: building storage capacity during the droughts to store water during the rainy days for the predictable rainless days. What's really surprising and somewhat ironic is that for all the scientific research on global warming, very little is being done to explore the correlations between the solar cycle and earth's atmospheric conditions. Go ahead and superimpose a plot of stock market behavior on top of the solar cycle. Recessions about every decade. Bursts of "excessive optimism" followed by rounds of pessimism. One could do some judicious estimating of market ups and downs. Could this be due to the "micro-bends"? You can find some nifty macro-stock market charts at www.chartoftheday.com. The last peak (cycle #23) was around March 2001; the next trough or valley is projected for 2004-2006 with the following peak around 2010. This data is available on a daily basis and can be tracked easily. Interesting, n'est-ce pas? If you think nerve gas is deadly, consider the effects of the dreaded dihydrogen monoxide (DHMO) - the unrecognized killer substance. It accelerates the corrosion of many metals. In gaseous form, it can burn human flesh. Symptoms of ingestion include "excessive sweating and urination". Prolonged inhalation of concentrated DHMO can cause death by asphyxiation. For those with a dependency on DHMO, complete withdrawal means certain and fairly rapid death. The only question remaining is whether a campaign should be launched to ban this substance. For further data, search the Web for "Zohner DHMO 1997". BTW, the chemical formula is H2O. Gotta do the homework. Would you believe that a graph of Lasson's variations in solar cycle matches up precisely with "global warming" - check it out. As the average time between energy peaks is reduced, the total energy absorbed by the Earth's atmosphere increases - that's arithmetic. The enormous concentrations of solar energy at the two poles due to the magnetic funnels probably account for the aurora borealis and the seasonal ozone thinning (with many anomalies and weak spots around the world) - the thinnest being at the equator and the thickest part at the poles - leading one inexorably to natural solar causes for "the ozone hole". These huge natural fluctuations (much greater than 5%) have been going on for thousands / millions of geological record years.... untouched by human hands.